The first chapter of this book is unlike any other mystery novel I have encountered. It starts slow, with high school maths teacher Ishigami crossing a river bridge, making his way to a little lunch bento-box café he frequents. His neighbor single mother Yasuko, who he has a crush on, works at this café. On the way, just like every other day, he notices a set of homeless men who live under the bridge, one crushing cans, another brushing his teeth - as mundane as it could possibly get. Later in the day, café worker Yasuko's good-for-nothing ex-husband turns up. He wants more money, brags that they will never be rid of him and makes suggestive comments about Yasuko's daughter. The daughter, terrified, attacks him with a copper vase and in the ensuing struggle Yasuko and her daughter end up killing the ex-husband. All this within the first chapter. 25 pages into the 374 murder mystery and we already know where, how and by whom the murder was committed! Enter neighbor Ishigami. He comes in with a promise to help get rid of the body, create an alibi for mother & daughter and prepare a cover story and script for them to follow during potential police questionings. "Trust me" he says "Logical thinking will get us through this". Sure enough the body is found soon. Face smashed in and fingertips burnt. Forensic tests eventually identify the victim and start questioning the ex-wife. 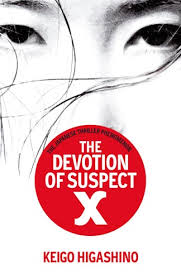 The investigating detective feel something is off but cannot quite disprove Yasuko's alibi. He turns to his friend, brilliant physicist Yukawa who often helps the police in solving difficult crimes. From this point on, it is a battle of wits between the 2 geniuses: Physicist Yukawa vs. Mathematician Ishigami - who incidentally were batchmates at the same university. As a reader who knows what has happened, the process of solving the crime still draws one in. You root for the murderers, feeling this was almost the only way out from the clutches of an abusive ex-husband. You watch while the detectives seemingly draw closer but somehow never close enough. I cannot reveal of course which genius wins this battle, but the twist in the tail is one you would never expect. The solution definitely floored me, and the taut storyline made this one of the most compelling page turners I have read in a long time. It is a refreshing change from all the who-dun-it mysteries I read earlier this year and the Tokyo setting only adds to the novelty. Keigo Higashino is definitely an author I've now added to my favourites and my list of recommendations for the upcoming holiday season.